Over the past 15 or so years, one of the garbanzo bean’s (or chickpea’s) processed forms—hummus—has exploded in popularity in the western market, despite being a staple of near eastern and Levantine cuisine for millenia. This is in part due to the embrace by the western palate of exotic cuisines outside the realm of typical “American” cooking. The other reason is due to the clear health benefits of chickpeas and hummus. 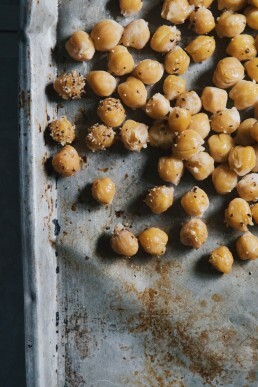 While chickpeas have been a staple of the American salad bar since long before hummus became a staple of many American homes, they haven’t been nearly as commonly consumed as they are today. In 2016, Americans consumed 222,000 metric tons of chickpeas. Boy howdy that’s a lotta garbanzo! Here we’ll look at some of the health benefits of chickpeas. We hope you’ll learn as much as we did about this crucial commodity! Nutrient profile: Chickpeas contain about 46 calories per 1 ounce serving, of which about 32 calories of which are from carbs, 12 from protein and the remainder from fat. It is also a good source of iron, manganese and B-vitamins as well as fiber (2 grams per 1 ounce serving). Of course, 1 ounce isn’t exactly a heaping helping, so we recommend a little more to get your fill (4-6 ounces should do the trick). Appetite Control: Like many legumes, chickpeas contain a powerful combination of protein and fiber that can help suppress a runaway appetite. These two nutrients act in concert with one another to fill a person up. The fact that chickpeas are so filling combined with the fact that they are only moderately caloric makes for a healthy and wholesome snack. Brands like Biena provide high quality chickpea snacks that will certainly satisfy a healthy appetite. May Help With Weight Loss: Because chickpeas have such a moderate calorie count and because they are so filling, including chickpeas in your diet can help you lose weight. Don’t confuse this claim as saying the chickpeas will directly cause calorie burn, although with a low glycemic index they take more calories to process than some other foods. Still, even though chickpeas are not diet pills, it stands to reason that replacing unhealthy foods with chickpeas can help with weight loss. Helps Manage Blood Sugar: Chickpeas’ low glycemic index can also help manage blood sugar. There are actually many studies available that demonstrate this. One showed that 19 people who had eaten 200 grams of chickpeas saw their blood sugar levels reduced by 21% as compared with a meal consisting of white bread or even whole-grain cereal. Another showed that 45 people who ate 728 grams of chickpeas per week saw significant reductions in fasting insulin levels, an important indicator of blood sugar control. Chickpeas are affordable and easy to include in one’s diet, especially with food brands like Biena who make chickpea snacks for people on the go. We hope you’ll eat more chickpeas. After doing the research for this article, I know I will! Let’s consider a controversial chemical: phenylalanine. Also known as aspartame, also known as NutraSweet, sometimes known as Sweet and Low, phenylalanine is an artificial sweetener that has been given the designation “generally recognized as safe,” or GRAS (yes…gras…the French word for ‘fat’) by the Food and Drug Administration. But who determines what is generally recognized as safe? What scientific means are used to determine whether or not something is safe. Do they conduct surveys of scientific literature to synthesize the conclusions of other scientists, or do they conduct studies of their own? We’re going to look at how a chemical like aspartame becomes “generally recognized as safe,” and we’re going to consider flaws in the process so that we can get a more complete picture of what this designation means and what impact it should have on your consumption decisions. On New Year’s Day 1958, a law went into effect called the Food Additives Amendment of 1958. The act presented a list of 700 food substances that food manufacturers would not have to test, but were “generally recognized as safe.” Since then, the FDA has added more substances to this list to take the burden of testing off of food companies. FDA Response to GRAS Notification: This is when a company does its own due diligence, either in-house or through a third party of non-governmental experts. First, companies schedule a pre-submission meeting with the FDA to talk about potential problems or challenges facing the review process. Then you are ready to submit a “GRAS Notice.” Of course, the GRAS notice must consist of research conducted by experts in relevant fields. As a matter of policy, the notifier must submit any information that may cause the substance to be considered inconsistent with a GRAS designation [of course, let’s keep in mind that trans fats were a GRAS substance until 2015. Literally a GRAS substance! (Gras is the French word for fat, c’mon pay attention!)]. After the notification is submitted, there are steps the FDA must take on their side. Within 30 days of when the notification is sent, the FDA will write back and let the notifier know they’ve gotten the notification. The FDA then looks over the document to determine whether it’s even worth reading (whether it meets all of the necessary requirements information-wise). If they have all the necessary information, they will then review that information and convene a panel of experts to determine whether the substance is safe. Depending on the panel’s findings, the agency will issue one of three types of letters. The first says that the FDA does not question the notifier’s claim that the substance is GRAS. The second type of letter determines that the substance does not have enough evidence to say that it is GRAS. The third letter indicates that the agency has ceased to evaluate the notice, at the notifier’s request. So do substances fall through the cracks and are still listed GRAS? Yes! The process is littered with loopholes so that substances like Red #3, a proven toxin, are still allowed in foods everywhere. Despite a lot of the pomp and circumstance, these designations are not perfect. Trans fats were discovered to have negative health effects in the early 1990s, but their GRAS designation wasn’t removed until 2015. The reason for this is because lobbying firms have connections within the FDA. People who previously worked for big food companies, also end up finding work in the FDA. There’s even direct corruption in the form of pay-to-play, but in a limited way. Essentially, the FDA is not immune to those corrupting forms of influences that plague other regulatory bodies. Also, companies that fund the research themselves often have biases in the research and will have their scientists emphasize positive findings about substances over negative ones. This is why the federal government must continue to fund research into the edibility of new substances that those in the food industry might wish to use as ingredients. Conventional wisdom tells us that whole foods are king. But what if you don’t have time to prepare a hot meal from scratch? Fortunately, there are frozen meals and foods out there that are made of well-sourced ingredients, unlike the bottom-of-the-barrel meat and produce used by some of the frozen meals industry’s worst offenders. Brands like Amy’s, Conte’s, Deep Foods or Red’s All Natural use quality organic and/or all natural ingredients and are healthy options for consumption at any minute of your busy schedule. We’ll look at a few of the brands we mentioned above, and see what it is about their products that makes them such healthy options. No discussion of organic frozen meals and foods would be complete without pioneer and industry juggernaut Amy’s Kitchen. All 250+ Amy’s products are vegetarian and do not contain hydrogenated fats and oils (trans fats), peanuts, GMO ingredients, eggs or seafood. This exclusivity of ingredients is a result of multiple health considerations, namely: how can we create food that is all-natural, allergy friendly, and trans-fat free? Amy’s also adopts a model of sustainability that involves sourcing from farms that use safe pesticides. In addition to observing good food practices, the company also treats its employees with fairness and kindness and minimizes energy use in its facilities. Amy’s is a 21st century company in that it views itself as part of a national and global community and does its best to serve that community both with its products and its corporate character. These are some burritos! It’s not often that you find a microwave burrito that really packs a caloric punch, but in all the right ways. These burritos will leave you feeling full of energy after eating them. That is because the ingredients are sourced from the most well-run and sustainable farms and because it contains no artificial preservatives. Good meat + good vegetables + whole wheat tortilla = happy belly. Happy belly = happy you. Red’s not only makes burritos, however, but they also produce microwavable meals, much like the ones Amy’s makes. Much like a “deep cut” on an album, Deep Foods is lesser known than these other two big players, but is still a hit among a smaller set of people. 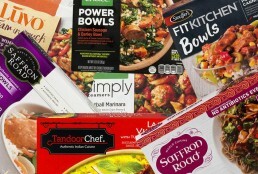 Deep Foods makes frozen Indian foods for an American market in such a way that is a well-won compromise between the Western and South Asian palates. They also make Middle Eastern and Near Eastern food, and it is safe to say these are healthy alternatives to Stouffer’s calorie-packed bonanzas. The concept of Conte’s is simple: Gluten free frozen pasta with high quality all natural fillings. But simplicity makes for delectability, as these pastas contain high quality meats and cheeses as well as vegetable fillings like spinach, tomato, and garlic. This is good stuff, and can be found in most metropolitan areas. So, don’t fear frozen food. Just be sure to know what you’re getting and always read the label and do your homework on companies to be sure of their reputations. The brands above and others can be very convenient alternatives to cooking from scratch, as well as delicious and healthy! There are a LOT of different types of rice available in this world. Hundreds. White rice, brown rice, red rice, gold rice, long grain rice varieties, as well as medium and short grain. These strains of rice vary in terms of the complexity of the carbohydrates therein, as well as in flavor or complexity. Some, like brown and red rice are more complex carbohydrates, while white and gold rice varieties tend to be more simple starches. White Rice: A simple starch, rice that has been converted from its natural brown or gold complexion to white rice loses 80% of its vitamin B1, 67% of its B3, 90% of its vitamin B6, and half of the manganese, iron and phosphorous found in the rice. So not only will white rice help you gain weight, but it also has fewer vitamins and minerals! What a draw! Brown Rice: With brown rice, only the outer layer—the hull—is removed. Besides that non-nutritive piece of the grain, the whole grain is left intact, leaving nutrients available to be consumed. 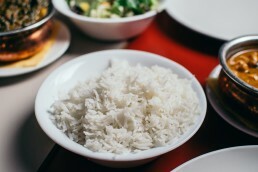 Jasmine and Basmati Rice: These two varieties of rice are both white in color, but should not be confused with white rice that has been converted to white from another color. If it says jasmine or basmati, you’re getting rice that was grown white that you can eat white. It’s still a simple carbohydrate, but in moderation can absolutely be incorporated into a healthy diet. Long Grain Rice: The length of long grain rice is 4-5 times its width. That’s about the long and short of it. Medium Grain Rice: Medium grain rice is 2 or 3 times longer than its width. Short Grain Rice: Short grain rice is roughly round and is really tasty! Like couscous! Red Rice: This is among the most underrated varieties of rice. Rich in antioxidants, low glycemic level, combats cholesterol and heart disease, and also containing a ton of fiber per serving. A cup of rice contains 8 grams of fiber. It’s tasty too! One of the drawbacks of rice is that it almost always contains trace amounts of arsenic. But before you get worried that you’re eating rat poison every time you pick up the chopsticks, know that the amounts are generally so low as to be negligible. The reason I bring this up is because organic rice is likely to contain less arsenic because, typically, rice farms use more than FORTY different pesticides to protect the crops. The primary difference between rice that is organic and rice that is not is that organic rice doesn’t use pesticides. Many damaging chemicals can be avoided by making the switch to organic rice. Brands like Lundberg Farms recommend themselves well to this switch and are definitely worth trying! "As 2018 quickly comes to an end, we wanted to take a moment to reflect on the many partners, customers and thought-leaders who made this a great year. Most importantly we want to recognize our farmers and ranchers. Their hard work and dedication to raising livestock humanely and sustainably is what truly sets us apart. From all of us at Niman Ranch, we thank you for your continued partnership and wish you a Happy New Year!" 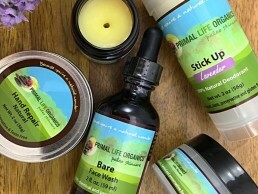 Stench and Guilt-Free: What Makes a Deodorant All-Natural? Everybody stinks from time to time, so everyone needs deodorant or anti-perspirant. But which should you use? Deodorant or antiperspirant? When you’ve settled on which you should use, then you have to choose whether to go organic. In order to make this decision, you must first understand: What makes a deodorant or antiperspirant all-natural? First of all, we must acknowledge that most antiperspirants cannot be classified as all-natural because they contain derivatives of aluminum that stop sweating entirely. For example: Old Spice’s Fiji Antiperspirant contains the following as its active ingredient: Aluminum Zirconium Trichlorohydrex Gly (18%) (Anhydrous). Rather, all-natural deodorants contain ingredients that kill the bacteria that cause foul odors. Essentially, the difference between deodorant and antiperspirant is that the former kills odor-causing bacteria while the latter stops sweating. The reality is that there are no chemicals found in nature that actually stop sweating, so only deodorant can be made without artificial ingredients. What Makes a Deodorant All-Natural? Essentially, a deodorant is considered all natural when it is made entirely of ingredients found in nature, such as natural oils or waxes. Often, natural deodorants will contain natural oils to form the base of the product. Then, some type of powder or starch is added for absorption and odor control. Some essential oils actually have antibacterial properties, such as lemon grass, rosemary, sage and tea tree oil. In addition to killing odor-causing bacteria, these essential oils add a natural fragrance to the deodorant product. Finally, many natural deodorants will contain a wax that lends the product the texture that big name deodorants have. Sweating purges your body of toxins. So when you apply antiperspirants, those toxins end up trapped in your body, threatening your lymph nodes. One study actually found that aluminum-derived antiperspirants can elevate a woman’s risk of breast cancer. So go natural! There are many brands on the market. Find the one that works for you! The average human gut contains 300-500 different strains of bacteria and around 100 trillion individual bacteria cells in the gut. These bacteria break down our foods and allow for the various nutrients therein to become a part of us. But these bacteria demand from us the foods they crave. And so we feed them. Some have preferences that are different from others. Some prefer fruits, plant proteins, and whole grains; some prefer meat; some prefer sugar and refined starches. The bottom line is: the ones you feed, you multiply. And some strains of the bacteria that prefers refined carbohydrates, such as Candida albicans, are nasty and can do terrible things to your body. So we’re going to look at some foods and beverages in 2019 that are beneficial to your gut health. These are foods that either add to a healthy microbiome (the term for the little world the bacteria inhabit), or kill off bad bacteria like Candida. First thing’s first: While foods that contain probiotics are tremendously good for you, of extreme importance is remembering to eat the foods that breed a healthy microbiome in the first place. Foods like fruits, vegetables, legumes, whole grains and less fatty meats like chicken breast. Good bacteria like good, whole foods. The importance of this cannot be understated. Before we look at foods that contain probiotics, we need to look at one key liquid that actually kills starch-craving bacteria like candida. Apple cider vinegar contains acetic acid, which is the active chemical in vinegar, and which also gives vinegar its taste and smell. Acetic acid kills the three problem strains of Candida, helping to restore gut health. Kombucha is a miracle beverage because it contains both acetic acid and supplemental probiotics. The acetic acid comes from one of the major bacterial strains in the concoction, acetobacter. Acetic acid is given off as a byproduct of cellular respiration and reproduction. So in a way, the acetobacter that grows in your stomach after drinking kombucha kills the candida. One could say that yogurt is inherently probiotic, since it is made by fermenting milk with bacterial cultures, but not all yogurt is created equal. Also, some yogurts’ colonies of bacteria are DOA when they hit grocery store shelves. Also, many yogurts are flavored with all kinds of artificial sweeteners or even with high fructose corn syrup—ingredients that are bad for the gut biome. Often, yogurts will list the types of bacteria they contain on the ingredients list, so it is recommended that you read the label. Some yogurts have a label from the National Yogurt Association that says “Live and Active Culture.” If you don’t see this just read the label and often there will be a bacterial strain or three listed. This is the good stuff. Have you ever had fresh kimchi that almost seems to fizz? Have you ever had sauerkraut that had that extra bite to it? These flavor attributes are all signs of a healthy biome growing on this food. Companies like Cleveland Kraut create products that are rich in probiotics and that promote a healthy gut biome. You can even ferment your own veggies. All you need is a mason jar, salt, water, and whatever spices you like. Just be careful you seal the mason jar so it is air tight. Failure to do so can result in a nasty and sudden death resulting from botulism. If you don’t want to risk it, you can find all manner of fermented products on the supermarket shelf. We’re rooting for your gut. We want you to be happy and smile like this author is doing after several days of eating and drinking a plethora of probiotic foods. Why is the author of this article happy? Because 80% of the body’s serotonin (the neurotransmitter in the brain that promotes feelings of satiety, happiness and well-being) is contained in the gut. Consuming a massive amount of probiotics like this author did can result in a calm feeling of tranquility. Give it a try sometime! You won’t regret it! All forms of life can be classified as one of three “biota.” The ones we most associate with food are flora and fauna—plants and animals, respectively. 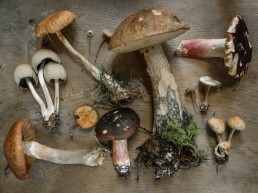 The third—fungi—we don’t care to eat as much because we associate it with rot and decay. But people have been eating mushrooms since the dawn of time, which is a confounding fact considering only 3% of wild mushrooms are safe for human consumption. People have been seeking out safe mushrooms because many of the ones you can eat are delicious. There is also great diversity within that 3% and people have enjoyed mushrooms for eons. Here, we’ll take a look at some of the mushrooms that are becoming more popular in the United States and that will be sure to rear their heads (pun intended) in 2019. Truffles have become more commonly found on grocery store shelves, both sold whole and as products like truffle oil and in chevre goat cheese. Truffles are delicious and good for you. Truffles are commonly found in Europe, in Italy and France. There are many kinds of truffles including white truffles, black truffles, and burgundy truffles. Truffles are anti-microbial, contain crazy anti-oxidants, and have many essential vitamins and nutrients such as magnesium, potassium, carbohydrate, dietary fiber, protein, calcium, iron, vitamin B-6, amino acids, terpenoids and sterols. They’re also very tasty and definitely worth a try. Enoki mushrooms, known in Japanese as enokitake, are becoming more commonly found on supermarket shelves beyond Asian grocery stores. Besides being tasty, enoki contains antioxidants. They come in cans or whole and can be cooked in a variety of ways. One of the most common types of mushroom, the oyster mushroom is beloved on multiple continents. They, along with the other two mushrooms mentioned here, also contain ergothioneine, which is a powerful antioxidant. Little known fact: chanterelle mushrooms contain a chemical called “lentinan” which is available as an injection in Japan for its anti-cancer properties. Yet another compound in this fungus is called lanthionine, which supports wound healing and platelet production, and also can help in the treatment of thrombosis. On top of that, this mushroom has potent anti-cholesterol properties. There are many more types of “’shrooms”, but we can only list so many here. Across the board, many of them contain the same nutrients, vitamins and minerals, along with a wide variety of antioxidants. So shroom it up and enjoy your fungus! Newsflash: weed gets you high. Of course, if you don’t like that, you don’t have to partake. “But,” you say, “there are so many benefits of marijuana. How do I take advantage of those benefits and not get high? The truth is, of the three most common active ingredients in marijuana (THC, CBD, or CBN), only one gets you high: THC. And the truth about THC? It doesn’t carry the same benefits as the other two, which, given the inherent drawback if you’re not into getting high, makes it unnecessary, particularly in light of the sheer beneficence of the other two chemicals. Fortunately, just as there are edible treats with THC in them, so exists food and beverage that contains these compounds, which essentially contain all of the benefits of cannabis, but none of the intoxicating effects. Here we’ll look at some of the benefits of CBD in particular and then we’ll look at some of the products on supermarket shelves that contain these friendly chemical compounds. Not that it’s wise to depend on CBD for cancer treatment, but consuming it may be beneficial in the long run as well as during treatment. In the very short run, CBD is an anxiolytic substance, meaning it inhibits action in the brain that causes anxiety. Inhaling CBD has been known to provide lightning fast relief to anxiety. It calms nerves in a way that doesn’t have the same side-effect of low grade intoxication that many prescription anxiety drugs like benzodiazepines have. CBD is a powerful, non-prescription remedy to anxiety. Of course, if you have been prescribed anxiolytic medication, we recommend that you go by what your doctor says and not our humble blog. While CBD does have proven anti-anxiety benefits, the prescription stuff is strong, and strong is what many people need for their anxiety disorders. If you have an anxiety disorder, ask your doctor if CBD will interact with your medications in any way, just to be safe. Pain is cruel. It spares no one and its remedies often carry the risk of dependence. Fortunately, CBD helps with pain. At one point in his life the author of this article purchased a cartridge of liquid CBD just to see what kind of effect the vapor would have. One day, while in possession of the oil, the author had to count out thousands of political signs in a warehouse, and so the author’s lumbar and upper shoulders started to take on a dull pain. The author then had several hits of the CBD oil vaporizer and the pain went away. That’s right: the pain went away. Period. No placebo effect. The pain just went away. That is the magic of CBD, a compound with extraordinary analgesic magic. One thing we cannot stress enough is that CBD has proven benefits to many conditions. It is not a cure to any of these conditions, but it can have a hand in ameliorating them. That being said, people who consume CBD on a regular basis were found to have a 16% lower fasting insulin levels than those in the five-year study that had never used cannabis. Researchers also believe that cannabis’s anti-inflammatory properties may be implicated in treating insulin resistance. There are many other benefits of CBD, ranging from anti-acne properties to providing seizure relief to sleep assistance to being a neuroprotective. Now we’ll take a look at the types of CBD treats available on the market. 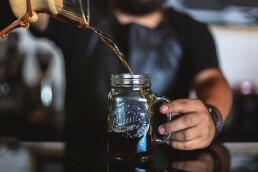 As of now, there are a slew of cannabis-infused beverages on the market, ranging in prospective production size from large beverage companies like Coca-Cola and Heineken to up and comers like Happy Apple, which sells apple flavored cannabis infused beverages. Coke is very secretive about its plans for a cannabis-infused beverage, but one insider said that Heineken’s beverage(s) will most likely be non-alcoholic and that the flavor may range anywhere from a “fruit flavor to a coffee flavor to a kombucha”. Of course, there are already products on the market such as “Cannabis Energy Drink,” which is a caffeinated beverage from Amsterdam that comes in (you guessed it) a bright green can with a pot leaf on it. We haven’t sampled it, so we can’t tell you if it’s any good, but it exists. “Legal” brand drinks are another option that’s currently on the market, which claims to give you a “relaxing high”. Of course, that wouldn’t be legal; the truth is the product contains only CBD, hence the relaxation. Ultimately the only thing that may be illegal about Legal beverages is false advertising, but we’re gonna go ahead and guess that it’s a good product. 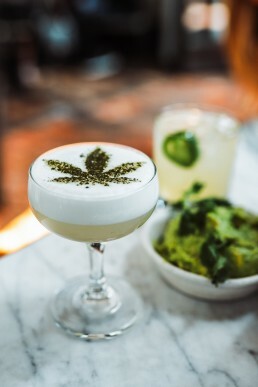 Other cannabis infused beverages include CBD-infused H2O by Root Origins and CBD-infused energy shots called Cannabis Quencher Sips. There are many CBD-infused foods on the market, but most of them are only available in markets that have legalized marijuana like Colorado or California. These products range from chocolate bars by Blank Brand to cookies to fruit roll-up type foods. To be honest, the foods I’ve listed so far sound like the kinds of things you’d eat after consuming these products, but CBD oil can also be added to pretty much any food so you can bake with it or add it to salad dressing. That’s right: the oil itself is edible. That means if you wanted to you could incorporate it into many dishes, as long as you don’t apply direct heat. You can add it to a smoothie or mix it into peanut butter. You can also mix it into condiments like ketchup. Nutiva actually sells hemp oil with CBD, and so does Aromatics International. Your best means of consuming CBD with whole foods is to add it in the form of oil. Just don’t put the oil over heat if you want to get the full effect of the CBD. You can order hemp oil with CBD online or find it at some local stores. Most of the CBD-infused treats are only available where marijuana is legal. CBD is good for you, and there are many good ways to consume it. If getting high isn’t for you, you should consider hemp oil or CBD-infused foods as an alternative. Ultimately, it is important that you’re happy and comfortable, and CBD definitely has a place in creating that space for any individual.